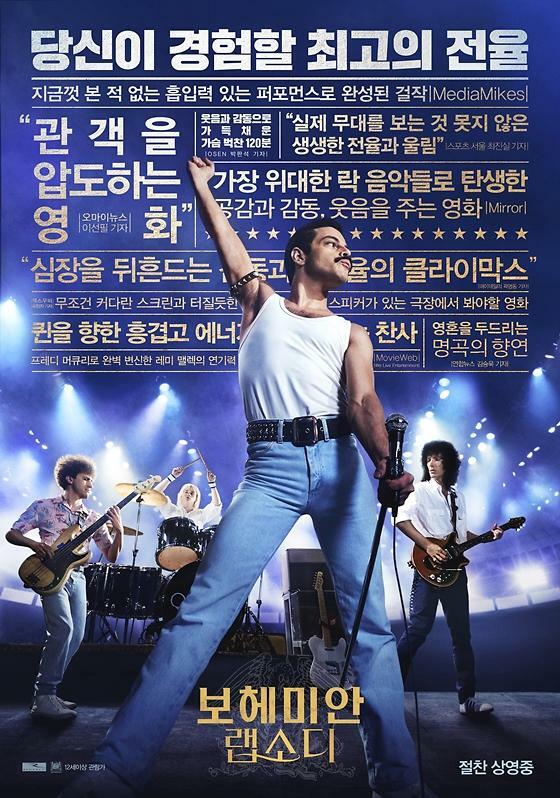 SEOUL -- "Bohemian Rhapsody", a biographical film of British rock band Queen named after the group's hit song of the same title, captured the hearts of South Korean moviegoers, selling more than seven million tickets since it was released on October 31. The film, which highlights the life of Freddie Mercury, the group's iconic singer, and his legendary "Live Aid" performance in 1985, was directed by Bryan Singer with Rami Malek playing Mercury. It was originally announced in 2010 but the actual British-American joint project kicked off in 2016 and principal photography began in London in September last year. According to the Korean Film Council, the film has garnered 7,060,149 viewers as of Sunday, becoming the third most popular film in this year's South Korean box-office after the home-made film, "Along with the Gods: The Last 49 Days", and Hollywood's superhero film, "Avengers: Infinity War". When the Queen film was released in South Korea two months ago, rock fans in their 30s and 40s were the main viewers but Bohemian Rhapsody soon became popular among all ages, attracting young and old generations who are not familiar with the British rock band. Online communities and social media bustled with people sharing reviews and opinions about the film. "The Bohemian Rhapsody phenomenon is all about getting to know a new culture and the fun of the process," Kim Kyo-suk, a pop culture critic in Seoul, told Aju News. He said the film's dramatic story and Queen's legendary songs have attracted all generations. "The fun of this movie is at its music and the way it unravels the background story of Queen's popular songs," he said. "You don't have to know the band before you watch the movie. It will be a fun experience for anyone and they will come out as Queen fans," Kim Ji-hoon, a 35-year-old businessman, said, adding hat Bohemian Rhapsody must be watched at theaters not through the small screens at home. The film's popularity has created a very rare scene at selected cinemas nationwide in a country where people often visit "Noraebang", a South Korean version of Karaokes. Franchise theaters operate at least seven "Sing-along-Cinemas" where fans can sing, dance and chant together by watching Queen's performance scenes. Other cinemas have allocated special halls equipped with top-notch audio devices and screen technology to provide an eye-popping experience. CGV, the cinema wing of South Korean conglomerate CJ, has Bohemian Rhapsody playing in its 270-degree cinema platform ScreenX. Megabox, a theater franchise, attracts moviegoers with Dolby Atmos, a special surround sound technology.